If you spot this yellow iris growing in the wild along shores, in swamps, or in roadside ditches, you know you’re looking at an invasive plant. This large, sturdy iris can grow four feet tall. With June come the irises, in Westborough’s gardens and in the wild, including – to the surprise of many people – an invasive yellow iris that grows in wetlands. Yellow iris (Iris pseudacorus), also called yellow flag, water flag, or yellow sword, thrives along the shores of lakes, ponds, rivers, and streams, and in wet meadows, swamps, and roadside drainage ditches. New England has no native irises with yellow flowers, so if you notice the bright yellow flowers of an iris growing wild in a wet area, you know you’ve spotted this invasive plant. This iris is large and sturdy, growing up to four feet tall. When not in bloom, it is hard to spot because its stiff sword-like leaves blend in with others such as cattail (Typha) leaves, reeds, and rushes. Like many invasive plants, yellow iris survives and even flourishes in a variety of conditions. It can grow right out of shallow water, as well as next to water. It does well in full sun or light shade, and has no trouble growing in very acidic conditions. It also tolerates periods of drought. And it even grows in the somewhat salty conditions of brackish water. How does yellow iris take over portions of the environment? It creates dense colonies and pushes out native plants and animals as it grows from thick, branching rhizomes (basically underground stems) that form dense mats. All parts of the plant, but especially its rhizomes, are toxic to wildlife. Yellow iris spreads by its seeds, which can float, and by its rhizomes, also called creeping rootstocks. The best way to prevent its spread is to pull or dig it out. It isn’t yet common in Westborough, so removing clumps can help to stop it from becoming established in town, where we have several ponds, five major swamps, and the headwaters of the Assabet and Sudbury rivers. Yellow iris is native to Europe including the British Isles, western Asia, and north Africa, where it has a long history. It was brought to North America as an ornamental plant in the mid-1800s and escaped to the wild. 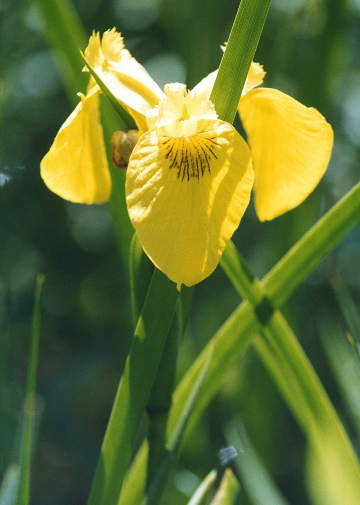 Yellow iris has also been used in erosion control and in sewage treatment. As an herbal medicine, its traditional uses included inducing vomiting and treating skin diseases. According to lore, a sixth-century king of the Franks in what is present-day France, King Clovis, noticed a large colony of yellow iris growing out in a river and realized that it meant the water was shallow enough to allow his army to cross. He used this insight either to find an escape route for his army trapped by opposing forces, or in another version of the story, to find a place where his army could sneak across the river and attack the enemy. You can also find clumps of this invasive plant at Mass Audubon’s Broad Meadow Brook sanctuary in Worcester (just off Route 20, a 20-minute drive from the center of Westborough). There it grows along Troiano Brook, which you can access from a dead-end parking area on Dunkirk Street. Colonies of yellow iris also grow on the banks of the Assabet River between Hudson and Stow, where canoeists are likely to spot them, and in parts of Marlborough. At this time of year you might also notice another wild iris growing in the woods on shorelines or in swamps – our native blue flag iris (Iris versicolor), which looks very much like the delicate blue irises of our gardens. This lovely native iris is not a problem in Massachusetts. The Brooklyn Botanic Garden recommends planting it in gardens as a native alternative to yellow iris. Due to their showy colors, irises were named for the Greek goddess Iris, who was followed by rainbows and served as messenger between the gods and people. In Greek mythology she also escorted the souls of dead women to the afterworld, a belief that led to the practice of planting irises near graves. It seems unfair that something as lovely as an iris could be invasive, but so it is with many non-native invasive plants. Massachusetts prohibited the importation, propagation, and sale of yellow iris (Iris pseudacorus) half a dozen years ago. It is also prohibited in Connecticut and New Hampshire.